As car accident attorneys, we know that the aftermath of a devastating car accident is often unbearable when it results in the loss of a loved one. The sense of loss is overwhelming from the onset and can take years to recover from. In the blink of an eye, or the turn of a wheel, one family’s structure is forever changed. For the survivors, a sense of guilt often haunts them. However, the fatal car accident was not your fault, and the responsible party should be held liable for the resulting damages. In 2014, approximately 2,500 people were killed in car accidents throughout the state in Florida. This is a small percentage compared to the total number of accidents which occur throughout the state. However, any accident which results in a fatality is one which could have been prevented, but for the actions of the responsible party. A large percentage of the number of fatal car accidents throughout Florida was caused by the driver who operated a motor vehicle in a careless or negligent manner, followed closely by the failure of a driver to yield to a right of way. The largest number of fatal car accidents occurred in Miami-Dade County, although the largest number of fatal car accidents caused by alcohol occurred in Hillsborough County. The related expenses which accompany the loss of your loved one can be brought in a claim for damages. An experienced personal injury attorney will assist you during this difficult time by projecting out the amount of future wages which your loved one would have earned. Florida is a comparative negligence state, which means that a victim’s family will always be able to bring a claim for damages, regardless of the percentage of responsibility of the victim. However, the amount of damages will be limited by the percentage of responsibility if the victim is found to be a percentage at fault for the resulting injuries. Your Miami wrongful death attorney will carefully examine the facts of the case to determine whether a court or opposing side could argue that the victim was at fault for their own injuries, and will work closely with your family to develop a claim against this fault. Your family has to deal with a life without your loved one after the fatal car accident caused by the actions of the responsible party, and they should not be forced to cover the resulting expenses. 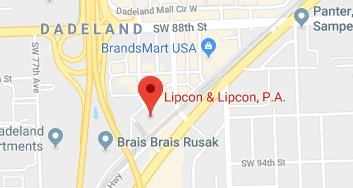 If you have lost a loved one in a fatal car accident, do not hesitate to contact the attorneys of Lipcon & Lipcon. Our car accident attorneys have years of experience in handling the issues involved in any automobile accident, and will work closely with you during this time. We understand that this is a devastating time for you and your family and we will work tirelessly to ensure the responsible parties are held liable for your loss. Contact our Miami, Florida office today for your initial free consultation.